This site is run by Richard Lewis trading as Delevine Media. 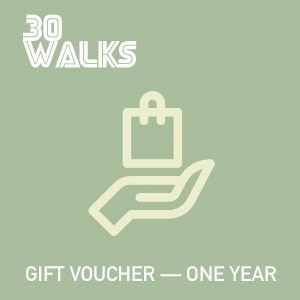 Our website address is: https://www.30walks.com. If you want an account with us we’ll need an e-mail address and some kind of name from you and also need to plant some cookies on your PC to run your account and logged-in sessions. It’s highly unlikely that anyone could hack the site and get any of your info because of the security measures we put in place. If they did, since we collect almost no personal data from you, they wouldn’t find much beyond your e-mail address. If you’re worried about what we hold, you can ping us and get an export of all your data and you can also ask us to erase all your data. Although, you can’t erase all your data and also have an account with us. Having an account doesn’t mean you receive all our marketing e-mail, you only get that if you opt in when creating your account. You can unsubscribe from the list and keep your account. If you upload images to the website, such as a profile picture, you should avoid uploading images with embedded location data (EXIF GPS) included. Visitors to the website can download and extract any location data from images on the website. If you write to us via the contact form, we receive your name and e-mail address. We retain this data indefinitely for the purpose of customer service but we don’t add them to our marketing list. Articles on this site may include embedded content (e.g. videos, streaming audio, etc.). Embedded content from other websites behaves in the exact same way as if the visitor has visited the other website. We use embedded content from: Soundcloud; YouTube (Google). If you make a purchase on this website we share your e-mail address with our payment processor, PayPal, in order for PayPal to process your transaction. However, once you log into PayPal, your transaction is carried out by that company. What little else we know about you we do not share. Nor will we. Send us an e-mail, or use the contact form and just ask us. Please use the same e-mail address you use to log into 30 Walks. We will then look for that e-mail address in our user database. If we don’t find it, we will ask you to supply the e-mail address you use to log into 30 Walks. Once we get a match we will compile your data and send an e-mail to you asking for you to confirm. This is to avoid third parties requesting your data. Once you confirm, we will send you a link to download the report. Here’s the thing: we can’t run your account without the data we keep. So only request this if you are done with 30 Walks and wish to delete your account. If this is the case, please cancel your subscription first, using the link on the footer menu, so that we know we have consent to end your account. Once you have confirmation your subscription is closed, you can contact us as per above and we will erase what we have. Please note, if you have opted into our mailing list you will continue to receive mail until you unsubscribe. Visitor comments may be checked through an automated spam detection service. Your IP address is logged by our security software, though it would only be linked to your name and account if you tried to hack the site. Please don’t try to hack the site. If you are concerned about privacy on 30 Walks you can write to Richard Lewis on richard [at] 30walks.com or just use the contact form. Your connection to 30 Walks is encrypted with an SSL certificate provided by the Internet Security Research Group (ISRG). We use weapons-grade web security software, which guards against brute force attacks, DDoS, malicious file uploads and code rewrites. Users are forced to create strong passwords. We do not have access to user passwords. In the highly unlikely event of a data breach on our own server, we will write to all users to inform them about the breach and provide instructions for remedial action. This will usually involve changing your passwords. If you buy physical goods from us, PayPal will send us your shipping address. We do not receive or purchase any other data from third parties. None. The very idea of profiling is offensive to us.